We live in Florida and I am passionate about taking care of my skin and my family’s skin to keep it as healthy as possible despite chronic exposure to the sun. I was very excited to learn about the new accént skincare product line which is designed to help soothe and protect all skin types. There are two key products in the accént skincare line including accént™ Moisturizing Lotion and accént Cleansing Wash.
My young daughter and I both suffer from sensitive, eczema prone skin. I was interested in trying this product line because it uses Protease Technology which is a “proprietary blend of plant-based enzymes, amino acids and moisturizers that work in concert”. Developed by dermatologists, I especially appreciate that both products are paraben-free and fragrance-free so I can feel confident using it with my entire family without worrying about potentially harmful or irritating additives. This skincare line also uses Vitamin B3 to help protect the skin’s barrier, fruit extracts derived from figs and pineapples as well as advanced moisturizers such as hyaluronic acid and amino acids. 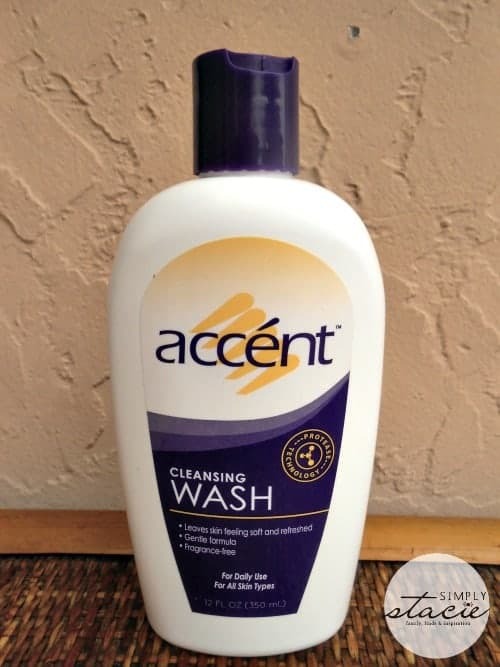 The accént™ Cleansing Wash ($14.99) is designed for daily use and worked equally well on my dry skin, my daughter’s eczema prone skin and my husband and boys’ normal skin. It is rich and creamy and cleanses without stripping our skin of necessary moisture. I love to use it pre-shaving too and my legs are silky smooth! 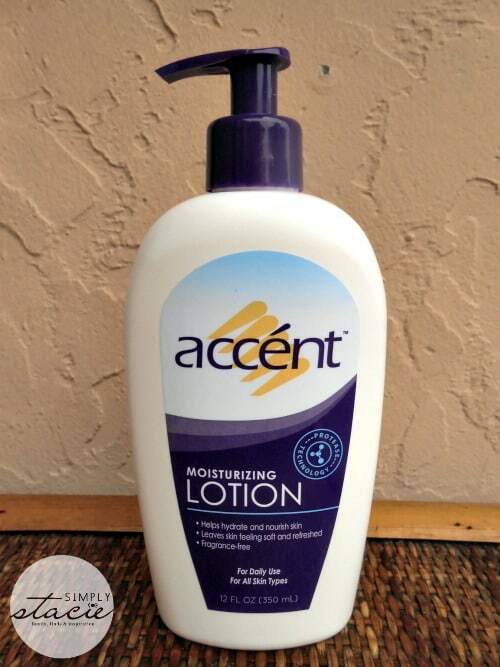 accént™ Moisturizing Lotion ($15.99) is an excellent moisturizer for the entire body. I use a few pumps of this luxurious feeling moisturizer to help soften my daughter’s dry and flaky skin. When I use this on my own dry legs, elbows and knees this is an immediate and long lasting difference in the appearance of my skin. I appreciate that there is no greasy residue and the product absorbs effortlessly into my skin. It doesn’t irritate our skin at all because there are is no added fragrance and it won’t clog the pores either. I use both of these products together for the best results and can purchase at CVS stores and online at Drugstore.com You are invited to visit accént Skin Health to browse the product line and learn more about how this skin care brand can help your skin. I like that it will keep my skin nourished. I’d like to try this brand to see what it is like. I get extremely dry skin in the winter and it sounds like this would be gentle enough to use and would moisturise my skin. I learned that it uses plant-based enzymes to help nourish skin. My legs are always dry so it would be great to try! I learned that it’s •Safe for daily use and all skin types. I learned it helps hydrate and nourish dry, flaky skin. I’d like to use it to moisturize my hands this winter. My wife would like to try it. It sounds like a great moisturizer for dry skin. I like that it contains plant-based enzymes for skin. I’d personally like to try the brand because my friend has recommended it and it supposedly is less greasy. I would love to try Accent products because they are from plant-based enzymes more natural & safe for all skin types!